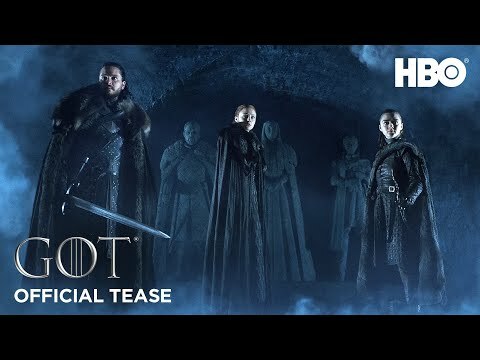 New teaser for Season 8!!! Man. They are going all Super secretive this year. We’re down to 4 months and still no real trailer. Love it though. Just watched that teaser and really liked it. Glad to finally have a confirmed date as well. obviously foreshadow with Jon’s Mother and the feather. April 14! By my calculations that means the penultimate episode will air on Mother's Day. I’m dying at this comment . Also did anyone notice Sansa had an elaborate braid in her hair? 50 million people watched the M*A*S*H finale ... And if you're talking "events" things like the moon landing and World Cup are in the hundreds of millions or more. I know this only applies to a limited number of people here but I was just thinking how awesome it would be to have a Bald Move live viewing party of the finale! I wonder though if watching it with a big group would work. I personally would want a zero talking rule and keeping all other distractions at a minimum would be optimal. I feel like we're all going to need someone to talk to after the finale haha! We've had a premier party for GOT at our house the last few seasons. It's a lot of fun, but I couldn't handle the distractions of watching the last episode with that many people. I need to be dialed in to see everything at the end. Don’t they have it where you can FaceTime with multiple people now? I don't think we are going to get an actual trailer with episode footage, we may just get a couple of these short film things, or if we do get episode footage itll just be a little teaser like the one from the Globes. I think they are going to keep it pretty secretive . I think that's Benjen not Jon. @rhcoop The last few years I've been going to a friend's house and watching it with him and like three or four other friends. There are sometimes quick jokes cracked but it's usually not too bad. One weekend last season, my friend was in town from Austin and she is huge fan and wanted to hang out and watch so she came with me and the first time someone said something I could immediately tell it bothered her. And then a little later, somebody else made a joke and she gave them the stink eye. And then another joke and then "ARE GUYS GOING TO WATCH THIS OR TALK?"..... The silence was deafening. She'd never met any of them before. She didn't know that's just how we watched it but she wasn't having it. We watched the rest in complete silence. She did apologize after but it was weirdly awkward. If I am in a small group, I can handle a little talk but when it's in a big group, I feel like it can get out of hand very quickly. We'd really have to treat it like a movie theater. I bet we'll get an actual trailer before it starts. Honestly though, I'm fine if we just get these thematic trailers. I'd rather see absolutely nothing beforehand. I wish more movies and shows would do this. If you listen to the Slashfilmcast Dave Chen pretty much avoids all trailers for movies before he sees them, I can definitely see how that could enhance the viewing experience. I don't have enough self control to do it though! @MrX I talk a big game but I can't resist them either!